The bearing installations to two Calm Buoys operating offshore Libya are indicative of the wide-range of applications Thordon's environmentally-safe bearing systems have outside the company's traditional maritime market. A total of 48 bearings and bushings were supplied in 2014 for installation to the chain stoppers of Monobuoy's 400t turntable Calm Buoys, a single point mooring system designed to allow oil tankers to load and offload cargoes offshore, without having to berth alongside the refinery. However, the ensuing Libyan conflict resulted in the project being postponed until late last year, when they finally entered service. "Despite the delay, construction and commissioning went very well," said Monobuoy's Andrew Charlton. "We have used Thordon bearings on two or three projects in the past. There are not many suppliers of these types of bearings, but we find Thordon offers a more simplified design and is easier to work with. When we have projects like this we tend to give Wenex a call to help during the design phase and assist with the calculations." Thordon's authorized distributor in France, Wenex, calculated the load on each bearing, a crucial element in optimizing the design of the Calm Buoys in line with the customer's requirement. Having a 12m (39.4ft.) diameter hull, the Calm Buoy can accommodate 4, 6 or 8 chain legs. An innovative and compact 40t chain pulling winch is fitted, making the buoys easy and quick to install. 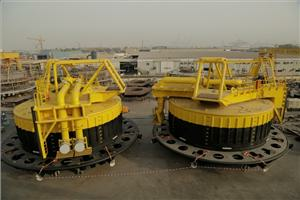 Single or multi-path swivel stacks can also be fitted with utility swivels to power and control subsea valves. For each of the buoy's chain stoppers Wenex recommended 32 abrasion-resistant ThorPlas-Blue bearings, due to their ability to pivot with the anchor chain. Thordon also supplied 16 SXL entry chafe bushings that were installed to provide a greater level of wear resistance to the anchor chain, while 32 SXL thrust washers were supplied to help reduce the side-to-side motion of the Calm Buoy during inclement operating conditions. "There is a willingness with Thordon Bearings to work with companies and come up with specific solutions for applications outside of the norm," said Charlton. "We are very pleased with the technical support Thordon and Wenex provide." Benoit d'Alançon, Managing Director, Wenex, said, "This was an important project for us. Calm Buoy projects like this are relatively rare in France, where Thordon bearings tend to be specified for use in the renewable energy sector, subsea turbines and river dams. We are delighted that Monobuoy's system is now successfully operating offshore Libya." One recent renewable energy project included the installation of Thordon bearings for the main turbine shafts of the 2MW OCEAN_2G tidal energy platform launched by Spain's Mgallenes Renewables last year in Vigo bay, Spain. A specialized stainless steel cladding solution was chosen to protect the 600mm (23.622") diameter shaft, and Thordon's COMPAC elastomeric polymer alloy bearings were selected to ensure the longest possible life in an unpredictable and demanding open ocean environment. George Morrison, Thordon Bearings' Regional Manager, said, "We are seeing increasing interest from industrial sectors outside our core maritime markets, particularly the mining, offshore and renewable energy sectors. Any rotating machinery can benefit both commercially and technically from our range of unique grease-free and water-lubricated polymer bearing solutions."